The Colorado Rockies have now lost back-to-back games by one run in the opposing team’s final inning. The 7-6 loss Thursday against the Diamondback’s came after the bullpen showed tremendous resilience, holding Arizona to only one run in the final four innings after Eddie Butler gave up six in the first five. 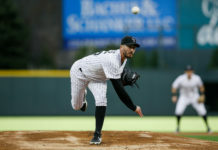 Carlos Estevez, who eventually earned the loss, seemed unworthy of the stat, as he was able to strikeout the first two batters of the frame easily and eventually induce a whimpy ground ball to Nolan Arenado to end the top of the ninth. Before that final out, though, three tough-break singles ended up being the difference for the Rockies. Walt Weiss said he liked his chances with Estevez going out there, even though he has pitched in three of the last four games. 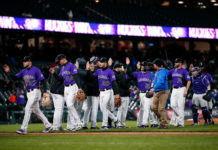 The way this bullpen has been taxed with early exits by Tyler Chatwood and Jon Gray, Weiss said the bullpen did an outstanding job putting up zeroes for nearly the last four innings. The Rockies needed it as starter Eddie Butler gave another inconsistent start, struggling the second time through the D’Backs order. The Diamondbacks started Zack Greinke, who has looked more like Zack Greinke of late, with an ERA in June of 1.47 after going through April with a 5.50 ERA. His slider was exceptional against the Rockies, along with his fastball command. All considering, the Rockies scored three early against the Cy Young ace. 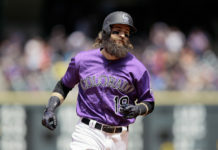 The bats went quiet until the eighth when the Rockies tied the score at six apiece. 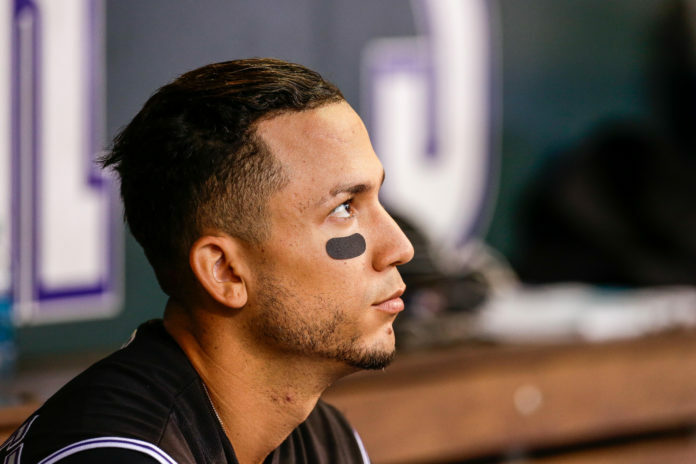 If one at bat could sum up an entire evening for the Rockies, it would be the one in the eighth by Carlos Gonzalez. With bases loaded and one out, Gonzalez struck out, and with an immediate grimace, he shook his right wrist. Team doctors told him he had a sprain after he took a hefty swing, but Gonzalez seemed more concerned with his production than his slight injury. “I think I just had a bad day offensively,” Gonzalez said. “I had so many opportunities in front of me and I didn’t get the job done. It’s just one of those days. It’s a bad day overall. If the Rockies are to get back in the NL West, leaving 11 runners on base cannot be part of their game plan. Even though Gonzalez is listed as day-to-day, expect him to lead the team against Archie Bradley and the Diamondbacks in game two of the series.